So it's January. The time of year where we feel guilty for our debauchery during the holidays. Alcohol, desserts galore, heavy rich food, you name it, you most likely had it and now you are furiously trying to correct your wandering ways. You might be doing a Whole30, a 21 Day Sugar Detox, or just in general trying to stick to a healthier diet. I know that I for one am definitely trying to get back on track. I was doing really well with my own 90 Day Challenge that is within days of being done until I went on my vacation to Mexico in December and then things got a little dicey. Surprisingly enough for me the food isn't so bad for me right now as I'm eating pretty much straight Paleo, but it's the movement I'm struggling with! Prior to my vacation I was doing yoga 2 x a week, pilates 1-2x a week, Barre class 1x a week, and walking around 45 minutes 3x a week. I even did yoga while in Mexico, which was a first for me. I NEVER work out on vacation! Even when I was training for Ironman triathlons. Go me with the “early” morning beach yoga. OK, 8:30 am is not early, but on vacation it is! I've been struggling since I got back though. Think partially because we were all sick in one way or another over the holidays as I had some fever that lasted several days and the kids had a stomach bug (LOVE those busy holiday airports with all their germs) and I also was scrambling to get everything done for the Thriving On Paleo Club launch last week. Whatever it was, the couch has been calling to me and I've not ignored its call, even now that we are all back to being healthy and the launch is over. Trying to change that today though and it's kind of amazing how just one small act towards a goal can propel you forward. I woke up and convinced myself I could do a super easy, short pilates workout video in my bedroom, and after I got done that I've been wanting to do more and more all day long. I guess it's true – objects at rest stay at rest and objects in motion stay in motion? At least in my case it seems that way. Oh, and if you have kids and haven't tried the free videos on GoNoodle, what a fun way to do a short little movement sessions with your kids! I just did one with mine and it sure got my heart pumping! Anyway – onto the salmon. Aka the reason you clicked on this post in the first place, right? We've been making this recipe for years after my step-mother-in-law made us something similar. We had such fond memories of it that we decided to try to recreate it in a healthier, more Paleo-friendly and more gluten-free way, and this is what we came up with. If you are asking why I say “more gluten-free” way – keep in mind that most soy-sauces have wheat (gluten) in them, so the coconut aminos I use in this recipe kill two Paleo-unfriendly birds with one stone: no gluten and no soy. You can use fresh or previously-frozen fish and this goes well with tons of side dishes, like roasted broccoli or a coconut cauliflower rice. Also, if you are being strict and avoiding sugars, make sure the ketchup you use is of the sugar-free variety. Steve's Paleo Goods makes a good one. Combine all ingredients except for the salmon and place in a glass baking dish. Add the salmon and marinate for 30 min to 2 hours. Heat an oven-safe frying pan or cast iron skillet on medium-high heat. Once the pan is hot, take the salmon out of the marinade (reserving the marinade) and sear salmon 1 minute on each side. Pour the marinade into the frying pan and bake in the the oven for 5-10 minutes until the fish easily flakes with a fork (5 for thinner slices, 10 for thicker). *for an AIP-compliant option, skip the ketchup. It doesn't make it that much different since it's just in the marinade. This looks amazing! I need a new way to cook salmon. Thanks for sharing! Oh we LIVE on Go Noodle in our crazy cooped up winters here! Ha! 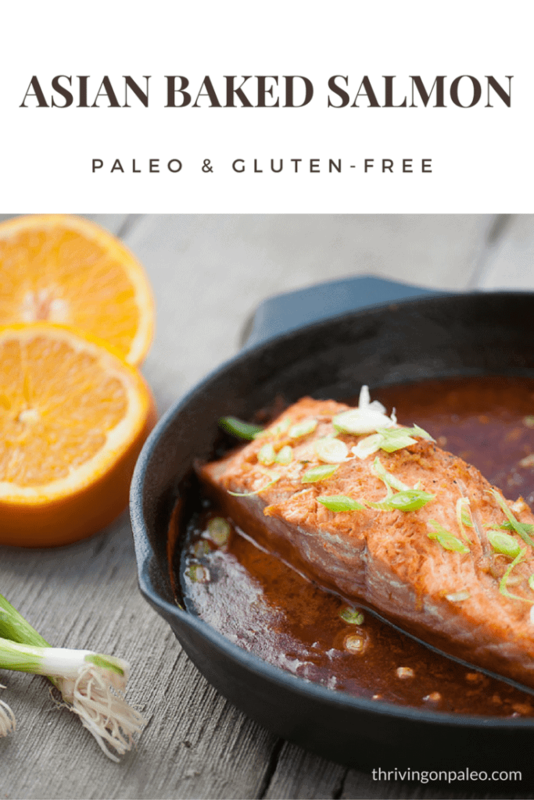 That salmon looks great – I don’t bake our salmon near often enough and this is so easy – my girls are freaks for salmon – I can’t wait to try this! Wanna know something funny? I was so sore the day after doing that GoNoodle that day too! Guess it works, ha! I love Asian food, and I love your photos! I just want to dive into my screen to snag a bite of this salmon. 🙂 This is definitely going on my meal plan for next week! Thanks. What a tasty looking salmon recipe! I love the Asian inspired flavors in this. I’m totally trying this next time I buy salmon! It looks and sounds amazing! Yum! I know how difficult can be to get back on track after crazy holidays, but I think we all need some time to adjust back to a regular routine. Yum! This salmon looks so delicious, firm, and amazing. Can’t wait to try it. I love salmon and this baked salmon looks absolutely amazing ! Salmon is my favorite! Especially with Asian inspired flavors! My family would devour this so fast, it looks absolutely delicious! I love all the sweet and savory flavors here! Can’t wait to try this salmon. 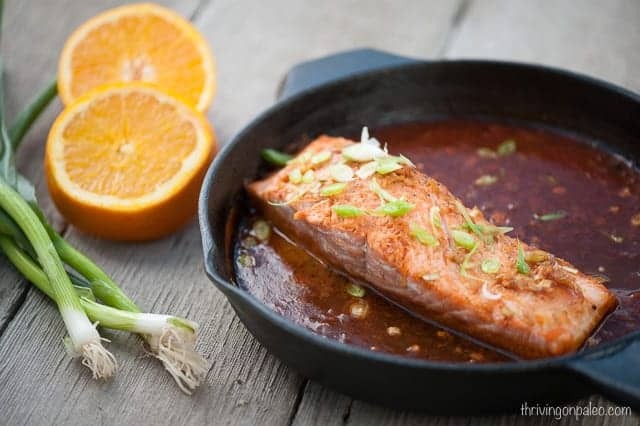 Salmon is a favorite fish in our house and I love the sweet/savory flavor combo! I’m glad we figured out ways to cook it that taste good because salmon was NOT a favorite fish in our house prior to that, haha! We’d eat it because we knew it was good for us but none of us wanted it. Ketchup on salmon! THAT is a new one to me. I love ketchup, but I don’t know that I could do that – ha ha!